Name Origin: The bridge took its name from the Trinity Square, and the area – from the Trinity Church, which was located here. Interesting facts: Legend tells that once a famous Russian aviator Chkalov flew under the bridge span to conquer the girl’s heart. In reality, a stuntman flew under the Troitsky Bridge during the filming of the biopic about Chkalov. Chkalov himself never did it, the episode had to explain why the pilot had been arrested on the eve of his own wedding. In reality, Chkalov was arrested for drunkenness and debauch. Legend: Troitsky Bridge is said to be the largest gift in the history of St. Petersburg, made after the military alliance between Russia and France. Some people believe that the bridge was built on the French money, while the Pont d’Alexandre III, the most beautiful bridge over the Seine, was constructed in Paris on the Russian money. 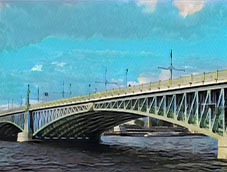 In fact, Troitsky Bridge was built on the Russian money. 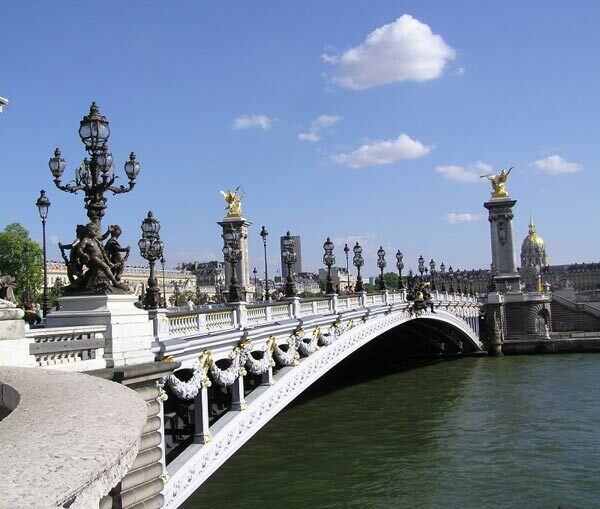 Nevertheless, St. Petersburg and Paris bridges, created simultaneously, were certainly the symbols of the military alliance. Of interest is that G. Eiffel, the author of the famous Eiffel Tower, took part in the building of the Trinity Bridge competition, but lost the second round to the company “Batignolles”.